They rode them down, Lara. Women and children, begging for bread. There will be no more 'peaceful' demonstrations. I must confess, I was preparing for a four hour lesson in movie classic boredom when putting in Doctor Zhivago until I realized it was done by Bridge on the River Kwai that even classic epics can be fun. Doctor Zhivago is proof that some classic movies are anything but boring. 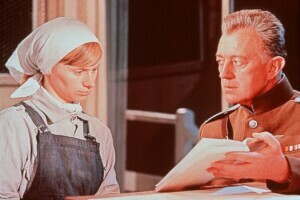 Doctor Zhivago is great entertainment even 40 years after its original release. Doctor Zhivago is a movie with many layers. While it tells a love story over a number of years, it also shows a great deal of the revolution of Russia from a country of classes to control of the workers. We watch our heroes grow over time, we see the paths of their lives intertwine over the years. We are told a great tale. Alec Guinness bring world class performances into a movie that truly holds its own as a classic film. I know what you're thinking, any movie with words like "world class" and "classic film" can't actually be entertaining, but this one is very entertaining. Here's a test that most Americans will fail. Sit down and start either Lawrence of Arabia, Bridge on the River Kwai or Doctor Zhivago. If you find your hand straying to your remove to skip the overture, than you need more patience. If you actually skip the overture completely, along with the overture you are probably better off with the instant gratification of Dude, Where's My Car. I recommend you force yourself to sit through these overtures, letting the environment of the film and the time it was released seep into you before letting the picture unfold. The DVD for Doctor Zhivago is an excellent two disc set that remasters the sound in Dolby Digital 5.1 and has a new 2.35 to 1 16x9 enhanced transfer that does a lot of justice to the original footage. There is no commentary track but there is a whole bunch of interviews, introductions, features and other bonus material. While not quite up to the quality of Seven, it is an excellent DVD nevertheless. Doctor Zhivago is a movie I would have hated as a kid, but as I find myself growing to really enjoy these classic movies. I am not at the point yet where I can sit through a single viewing of 8 1/2 but I am able to at least enjoy classic American cinema. All you need is a little patience, something lacking in us nowadays, to really benefit from this great film.